Uranium first appeared on a draft list of critical minerals published in mid-February, a result of an executive order signed by President Trump in the final two weeks of 2017. That executive order aimed first to create a list of critical minerals. This list would be different from the one the U.S. Geological Survey had updated literally the day before, which didn’t include uranium or 12 other minerals now on the list. Next, the order took aim at developing a strategy that includes “recommendations to streamline permitting and review processes,” “enhance access to,” and “increase discovery, production, and domestic refining of” the minerals on this new critical minerals list. That strategy to enhance access to uranium and other minerals is due from the Department of Commerce in the coming months. The uranium mining industry has advocated hard in this administration for the federal government to boost the value of uranium, justifying its demands with claims of the mineral’s importance to domestic energy independence, economic development, and national security, though none of these claims lines up with reality. So, the listing of uranium as a critical mineral was undoubtedly a savored gift to the uranium mining industry. This may foreshadow outcomes in other anticipated decisions by this administration, among them, the uranium industry’s petition for forced purchase of their products. In reference to that petition, an executive at Energy Fuels — owner of several Grand Canyon area uranium mines and claims — is quoted in a presentation to investors saying that it “could change our business overnight.” The other looming decision? Whether or not the administration will heed industry’s incessant calls to rescind the current ban on new mining claims around the Grand Canyon. The Grand Canyon Trust and our partners are not standing down. In fact, we’re ramping up our efforts to protect the Grand Canyon region from uranium mining. Part of that effort includes shining a spotlight into the dark corners the mining industry hopes will hide its deceptive and profit-focused intentions at the expense of the public. The Grand Canyon and the people, wildlife, land, air, water, and sustainable economies that rely upon it are too important to be written off for the quick profit of a few. You can count on the Grand Canyon Trust to plant itself firmly between industry and the canyon. 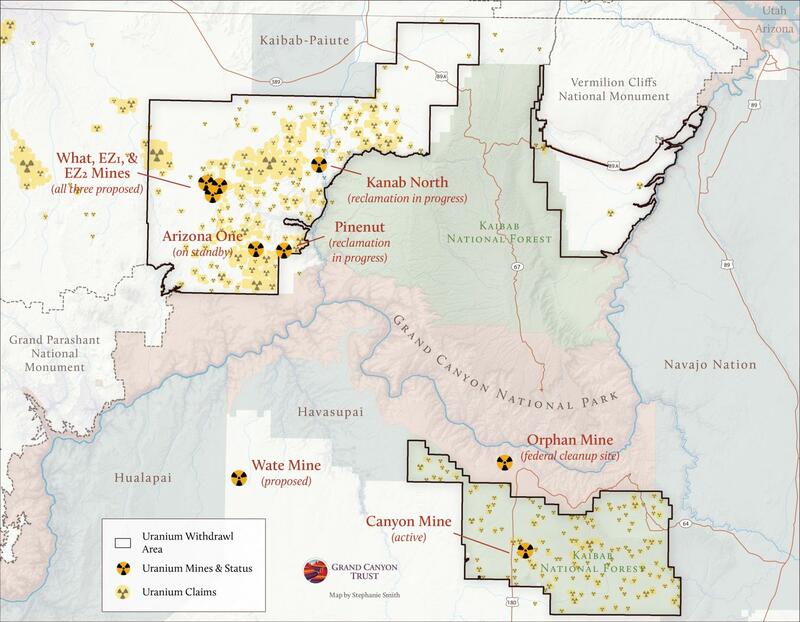 See a map of uranium mines and claims in the Grand Canyon region.